Vancouver Pen Club: September meeting photos---Blue Fountain Pens! September meeting photos---Blue Fountain Pens! We had good attendance for our September meeting (18 members) for our topic---Blue Fountain Pens. Many thanks to Jerred for the theme idea! Photo above showing some really nice blue fountain pens brought in by Jerred (from left to right): Platinum 3776, Monteverde Catalina (in a uniquely blue colour...just gorgeous! ), Delta Vintage, Levenger True Writer Select, Delta Journal, Retro 51 Tornado, Delta Indigenous People's Hawaii model and his Pilot Legance. A couple of cool-but-inexpensive blue Jinhao fountain pens in the photo above---the light blue clear pen is Harry's Kaweco Jinhao '599' fitted with a Kaweco nib he bought separately, and the darker pen below it is Justin's Jinhao X450. Justin also brought in his newest acquisition, the beautiful Platinum Moon & Rabbit maki-e fountain pen (not pictured). Leo's colourful blue-marbled Laban Sceptre fountain pen and his Cross Verve, a discontinued model with an interesting nib design. Some really nice vintage fountain pens brought in by Christopher R--from L to R: Parker Burgundy Pearl Marble Vacumatic, a couple of Parker '51' Vacumatics, a Parker Vacumatic (in Azure Blue Pearl, I believe), a Sheaffer flat top model in Jadeite plastic, a blue Sheaffer Cadet, a Parker '61' in Vista Blue colour, and last but not least, a lovely Parker Vacumatic in the desirable "Golden Web" design! Some of Dave M's amazing blue fountain pen collection--from L to R: Waterman 'Hundred Year' Pen in transparent blue Lucite, a Parker Duofold replica, masterfully-made by Chris Thompson, and a boxed Parker '51' set. Dave also brought in a few other wonderful blue pens (a vintage Parker Duofold in Lapis colour, a Waterman Edson and an OMAS 360) that are not in the photos. Two modern German classics---a clear blue Pelikan "Pelikano" and a Lamy Safari in the hard-to-find light blue with red clip colour combination (nicknamed the "Smurf" Safari). I'm trying to remember who brought them in but I can't recall! New member Terry brought in some of his pens, including (from L to R) a blue marbled Waterman Laureat for our theme, a Parker '51' and an attractive Waterford Beaumont. Longtime VPC member Stuart always brings in lots of pens for our themes, so in the photo above you can some blue pens (jumping from L to R)-- a Kaweco Student fountain pen, a Sheaffer Imperial, a Waterman C/F, a Sheaffer Admiral, a Sheaffer Crest, a Sheaffer Sentinel, and a Sheaffer Tuckaway model. Some more of Stuart's blue fountain pens (jumping from L to R)--a blue Pentel Tradio, a blue vintage Ever-Ready fountain pen, a blue Pilot Prera and a Sheaffer Intensity in the striped Cornflower design. We always have "New Acquisitions" as our secondary topic, so I snapped a quick photo of two exceptional ones brought in by June---her vintage Wahl-Eversharp in Jet Black, and Visconti Ragtime. 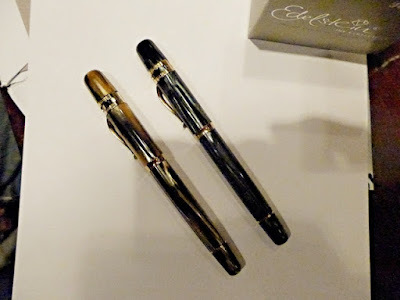 A photo of Bart and June's newest acquisitions----their "his and hers" Ragtime Visconti models. Bart's is the bluish marbled one and June's is the brown marbled version. My photos cannot do them justice, but they are gorgeous writing instruments! I try my best to capture all the examples brought in by our members for our topics, but our meetings often get verrrrry busy, so in addition to not photographing my own blue pens, I also forgot to snap a photo of Mark's British Parker Duofold, Andrew's blue Pelikan Technixx & modern Parker Duofold in blue, as well as Bruce's amazing collection of blue Italian fountain pens (an old-style OMAS Paragon, an OMAS Novelli limited edition, a Visconti Van Gogh, a Visconti Aida, a Visconti Homo Sapiens in blue crystal swirl, and Visconti Voyagers from three different generations: a Lapis model, the Anniversary model, and a Kaleidoscope) as well as a cool TWSBI Vac 700 in clear blue and a Pelikan M805. Great collection, Bruce! Hi there! We're actually just a pen club...not a pen store. Best of luck finding the Al-Sport you're looking for!